... and nothing is harder to find. Soma Luna manufactures all types of Black Candles, and we guarantee you will not find them any blacker than ours. Our candles burn longer than most, and the color is locked in using our special formula. Our prices can't be beat either, especially for candles that are perfect every time. Look no farther for all of your black candles, a solid black color all the way through the candle. We use only pure cotton wicks. 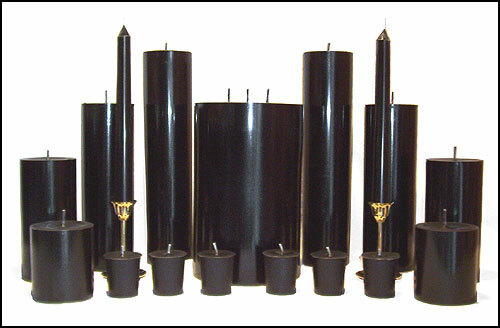 We have black tapers candles, votive candles, floater candles, tea-lights, pillars candles in many sizes and 3-wicks pillar candles. Made in the USA here at Soma Luna LLC - your Black Candle headquarters.